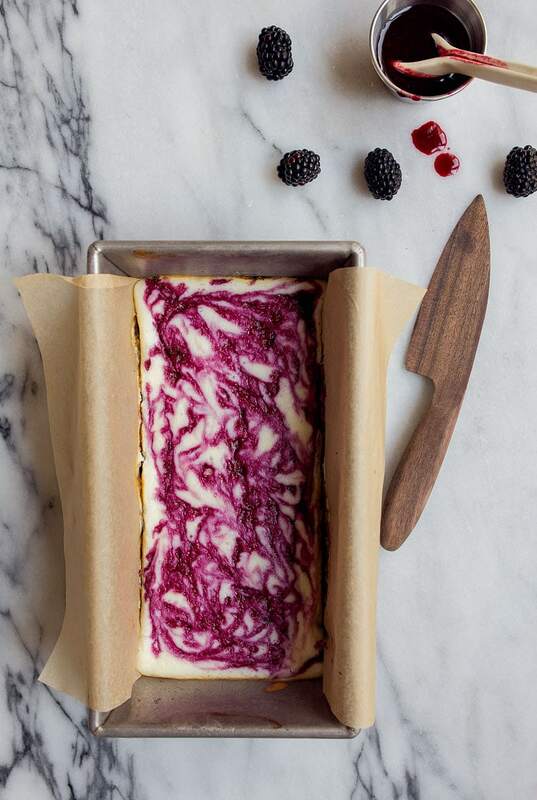 Blackberry cheesecake brownies for two. This post is sponsored by Kerrygold, a butter brand that I’ve worked with for 7+ years, and love to the moon and back. I’ve got this little daughter who loves the color purple. She also loves to throw tantrums, but that’s a little beside the point. Unless you use a brownie to quell a tantrum, which I don’t recommend. (but sometimes resort to, let’s be honest). I’ve been pretty judicious when it comes to letting Camille eat dessert. I always make sure it’s homemade. The chemicals in store-bought mixes and commercial bakery products legitimately scare me. If Camille is going to eat a brownie, I want it to be a homemade brownie. 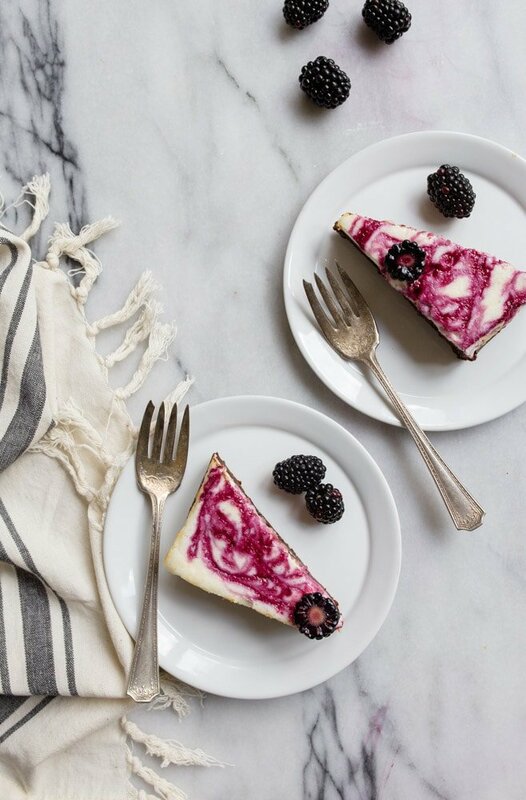 I saw these gorgeous blackberry swirl cheesecake brownies from my girl Sarah over at Broma Bakery. The intensity of the purple swirls drew me in. I just knew Camille would squeal when she saw them. I love that Sarah used fresh blackberries and a generous cheesecake topping on her brownies. I was sold. But, as usual, I wanted to scale it down to make a small batch of brownies. I grabbed my trusty bread loaf pan, which makes two perfect giant brownies, and got to work. I roughly halved the recipe for my loaf pan cheesecake, and poured it on top. Making the blackberry mixture simultaneously was easy. When I pulled them out of the oven, I did a little gasp. So freaking pretty. I let them cool completely in the pan, popped them in the fridge and made an eccentric veggie-heavy dinner. I promised Camille a purple swirl brownie at the end of dinner. It worked like a charm. Until she scraped off the cheesecake layer and ate the brownie part alone. Then, she asked for fresh blackberries when the brownie was gone. THIS KID. 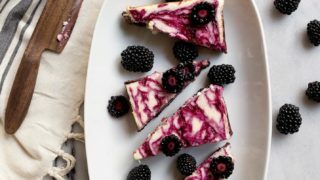 Make these blackberry cheesecake brownies for two before blackberry season is over, because seriously, frozen blackberries are like rocks with pebbles inside of them. Not good. The organic ones this year are so huge! I love them. Blackberry cheesecake brownies for two. First, make the blackberry sauce: add the blackberries and sugar to a small saucepan. Crush lightly with a wooden spoon, and turn the heat to medium. Let the blackberries cook until soft and falling apart (about 10 minutes). Push the blackberries through a sieve to collect all of the juice and discard the seeds. Set aside. Next, make the brownies: combine the butter, sugar and cocoa powder in a medium microwave-safe bowl. Heat on HIGH for 30 seconds. Stop, stir the mixture, and then place it back in the microwave for another 30 seconds. Stir the brownie mixture gently to cool for about 3-4 minutes, and then stir in the salt and vanilla to further cool it. Once the brownie mixture feels warm (but not hot) to the touch, add the egg and stir until combined. Preheat the oven to 325-F.
Line a 9x5x3” loaf pan with parchment paper, leaving extra on the ends to serve as handles. Spread the brownie mixture evenly in the bottom of the pan. Next, make the cheesecake filling: combine all ingredients and beat until smooth with an electric mixer, about 3 minutes. Pour the cheesecake mixture over the brownies, and gently smooth. 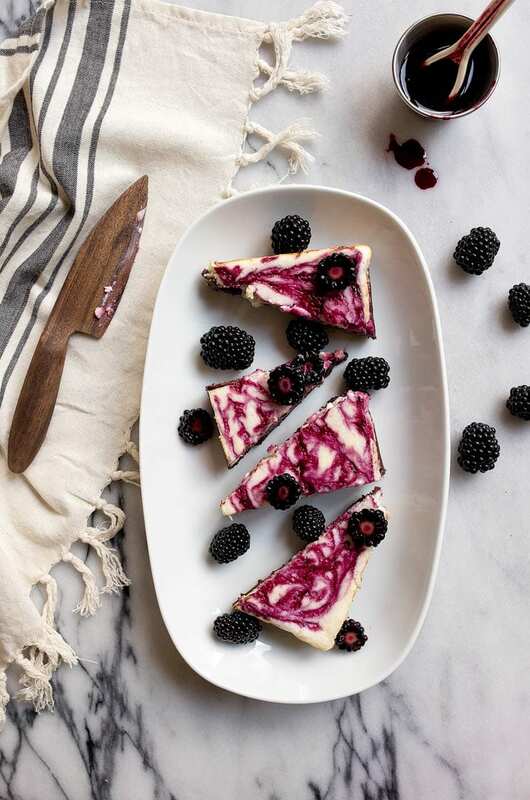 Next, drizzle the blackberry sauce on top of the cheesecake, and use a toothpick to gently swirl it into the cheesecake layer (try not to swirl it into the brownie layer). Bake for 45 minutes, or until the edges of the cheesecake start to turn golden brown, and a toothpick inserted to the cheesecake comes out mostly clean. Let the brownies cool in the pan to room temperature, and then slice. Refrigerate for the easiest slicing! Enjoy! So delicious and the swirl just makes them look so lovely to look at! These are a definite mute-try since I’ve got some lovely blackberries begging to be used. what a pretty looking dessert…purple is my fav too..
You posted these at the perfect time! It was my blackberry-loving father-in-law’s birthday. I made these for him and they were a huge hit. This is a very easy recipe with super fancy, delicious results. Thanks for another great recipe! nice, love the blackberries AND the brownies, beautiful photographs too, thank you for this! Cheesecake and brownies together?! YUM. And fresh blackberry on top of that?! AMAZING! Can’t wait to try these! Can’t wait to eat some tonight! I’m pretty excited to try to use this recipe! it can be magnificient cheesecake for birthday! I thought the cheese mixture was quite bland. This made the brownie a bit overpowering. would rate it a 3 out of 10. But then again I am an amateur…. Swapped in some raspberries because that’s what I had on hand and these were AMAZING. Perfect size for the two of us. Just came out of the oven and it’s just BEAUTIFUL! Smells amazing, too! These are in the oven now! I am excited.